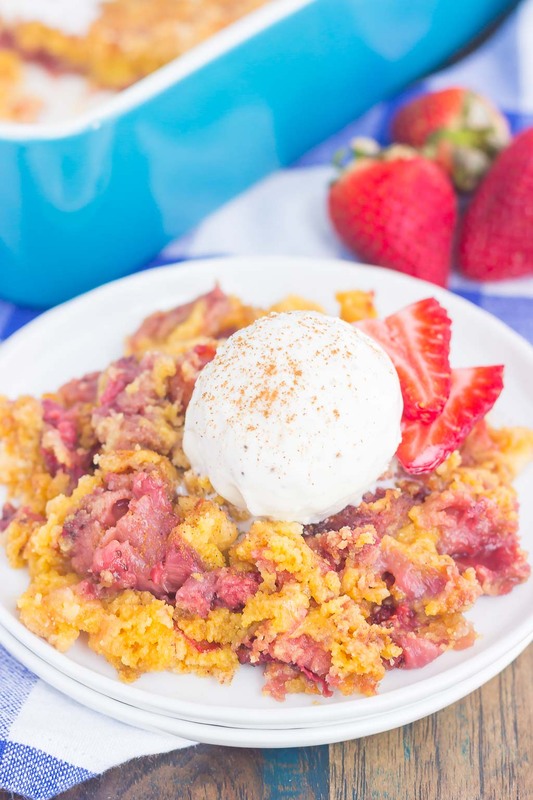 This Strawberry Cinnamon Dump Cake is a deliciously easy dessert that’s loaded with flavor. With just four ingredients and hardly any prep time, this simple cake tastes like your favorite cobbler, but without all of the work. Filled with fresh strawberries, a hint of cinnamon and topped with a buttery, crumbly topping, this dessert is sure to be a winner all year long! Have you had one before? Or even heard of it? 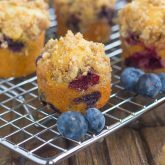 I first heard of dump cakes when I was scrolling through Pinterest about 4 years ago. I immediately clicked on a dump cake recipe because of the name. I mean, why would a cake be called a dump cake? Sounds pretty unappetizing to me, until I saw why it was called that. If you’re not familiar with dump cakes, let me fill you in. It’s just what the name implies…you ‘dump’ all of the ingredients into a pan and bake! There are usually no complicated or lengthy ingredients. 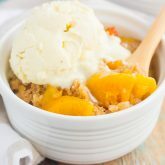 In fact, the first time I made a dump cake, it contained just four ingredients: canned pie filling (I used peach filling), peach slices, dry cake mix, and butter. That’s it! You layer everything together and bake until it resembles a cobbler. But, without all of the prep work, of course! 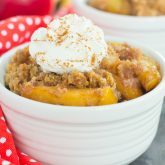 Remember this Slow Cooker Apple Cinnamon Dump Cake from two years ago? It got rave reviews, so I decided to whip up another tasty dump cake, but this time, with no slow cooker and using lots of strawberries! Especially come summer, it’s a dessert that I turn to in a pinch. Just a few ingredients, less than 5 minutes of prep time, and into the oven it goes. What could be better? 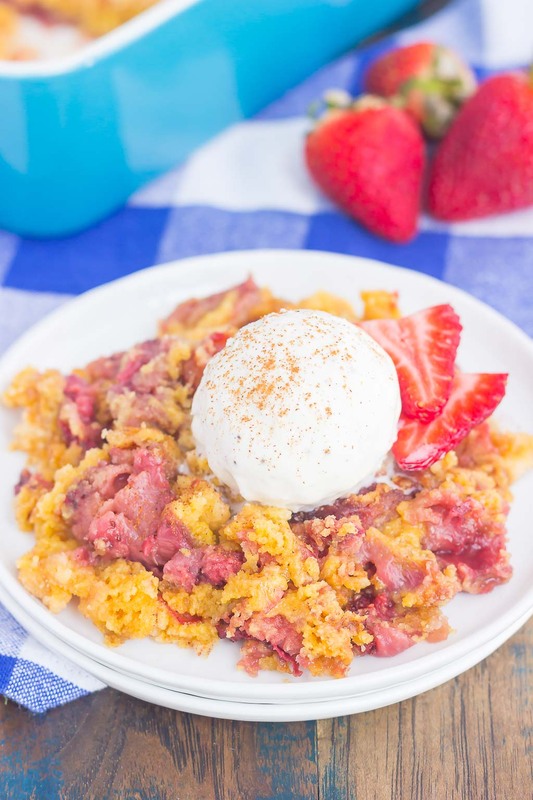 Trust me when I say this Strawberry Cinnamon Dump Cake is one of my favorite desserts to date. I feel like I’m cheating with just four ingredients (and maybe I am) but I can’t believe how delicious this sweet combination is. 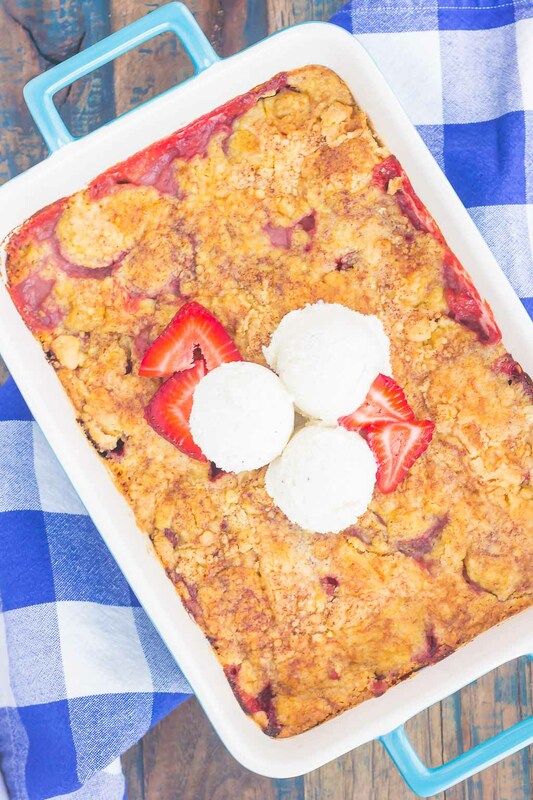 The fresh strawberries bake up soft and juicy, while the touch of cinnamon and buttery, crumbly topping give it the perfect touch. Mmm mmm good! For this dump cake, I used fresh strawberries, sprinkled with a touch of cinnamon, and then a golden butter cake mix for the topping, along with another sprinkling of cinnamon and some butter on top to make that crispy, crumbly, buttery, cobbler-like topping. Now, here’s where the beauty of the recipe comes in! You could easily use frozen strawberries, or even canned strawberry pie filling, if you’re short on time or don’t want have fresh strawberries on hand. And for the cake mix, yellow, white, strawberry, or french vanilla works perfectly, too. I chose to use the golden butter kind because of the richer taste. Remember when I said that the prep time for this Strawberry Cinnamon Dump Cake was a breeze? It really is, friends! Slice your strawberries (or use frozen ones if you don’t have fresh ones available), layer on the bottom of a greased pan, followed by a touch of cinnamon and cake mix on top. Add the slices of butter and pop it into the oven. In about 45 minutes, your decadently sweet dessert will be ready to be devoured. 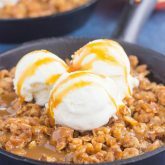 It’s best served warm with a big scoop (or three) of vanilla ice cream! Looking for more cake recipes? I’ve got you covered! 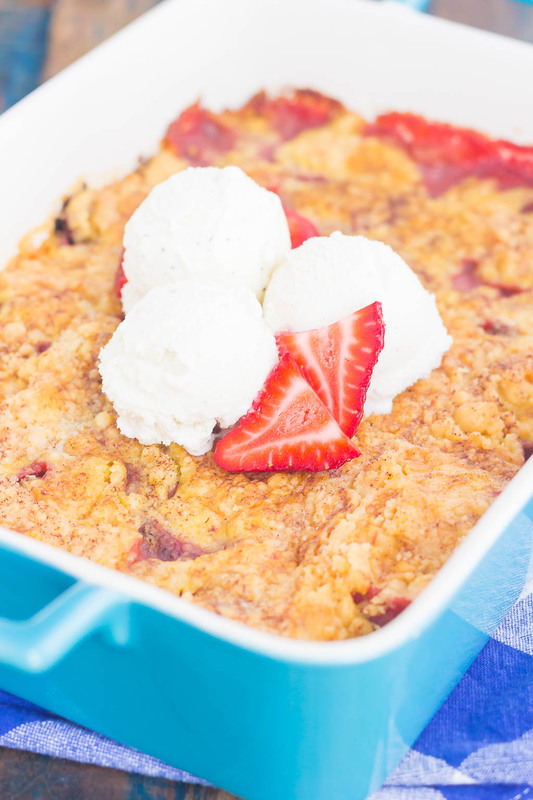 This Strawberry Cinnamon Dump Cake is a deliciously easy dessert that's loaded with flavor. With just four ingredients and hardly any prep time, this simple cake tastes like your favorite cobbler, but without all of the work. Filled with fresh strawberries, a hint of cinnamon and topped with a buttery, crumbly topping, this dessert is sure to be a winner all year long! Preheat oven to 350F. Lightly spray a 9x13 baking pan or glass dish with non-stick cooking spray. Place strawberries in an even layer onto bottom of prepared pan. Sprinkle with 3/4 teaspoon cinnamon. Sprinkle dry cake mix on top of strawberries in an even layer, followed by 3/4 teaspoon of cinnamon. Place sliced butter on top of cake mix, covering as much of the mix as possible. Bake for 45-50 minutes, or until toothpick inserted into center comes out clean. Serve with vanilla ice cream or whipped cream, if desired. Thanks, Sarah! Such a delicious cake! My cousin made a pumpkin dump cake for Thanksgiving one year and it was absolutely delicious. I love this summery version filled with fresh strawberries and warm cinnamon! This is perfect with a scoop of ice cream! Thanks, Marcie! I can't get enough of dump cakes! Never had a dump cake but can't wait to try it!So easy to make! Love it! Thanks, Mira! It's so good! Only four ingredients? Wow! It looks so good and so easy to make. Really gorgeous pictures. Thanks for the kind words and for stopping by, Susana!